The Beatles Rock Band is quite possibly the most artistically beautiful video game ever made. It’s striking. From the opening vignette, to the storyline transitions, to the in-song animations. Truly incredible and captivating. And what makes this even more amazing is that in most music simulation games, you’re entirely fixated on scrolling dots. The game takes you through the Beatles career from the Ed Sullivan Show, through their early career, into trippy transcendence. You can play the guitar, drum, and sing. Actually, many can (and should) sing as there are multiple vocal parts where you need to harmonize. I never tried that as I can sing only one note but I’d love to hear a group actually do this. To you people who have to be “that guy” and say, “real instruments are more fun” or “why don’t you play in a real band”, your argument is tired and short-sighted. We understand that real music is more difficult and more rewarding, but there is no way I could pick up a real guitar and play all these Beatles classics in the couple hours I have. My goal is to have fun, not struggle. By this logic I could say, “you know, I don’t need to play real tennis when I could just be playing on the Wii”. Or better yet, say, “Gee, I feel like invading Normandy. I’ll book a trip to England, rent a boat, and scale the French coast with a rifle.” If you’re anti-video games, fine. But don’t just be anti-music video games. 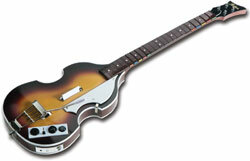 But even then I’d STILL argue that playing Beatles Rock Band is a GREAT way to explore their music. While playing, I was impressed realizing the different chord changes, off beat notes, difficult harmonies, and more. I would never notice these things just listening to their music. Anyway, enough, just stop. Overall, it’s an amazing game that sets the standard for how band-specific games should be made. Not only that, but the people at Harmonix have something special compared to the folks at Activision. Beatles Rock Band just feels better than Guitar Hero 5. I don’t know if it’s just smoother, the notes make more sense, or what. But it’s painfully obvious when you play the two side-by-side just how much better engineered Rock Band is compared to the Guitar Hero series. The one requirement for this game is that you actually like, on some level, the Beatles music. Because it’s ALL BEATLES. Though there are some more obscure tracks, most songs are instantly reliable. But most people do. 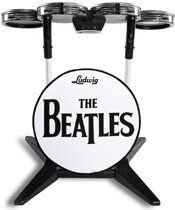 So give The Beatles Rock Band a whirl the next time you have the chance.